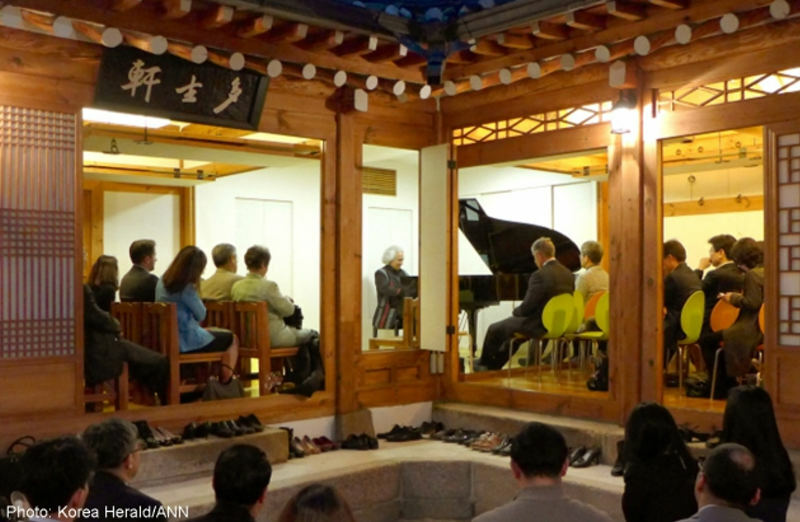 Pianist Manuel Obregon plays Costa Rican music at a traditional Korean house in Bukchon Hanok Village in Seoul on Wednesday. COSTA RICA EXTRA – Pianist and former minister of Culture and Youth – Ministero de Cultura y Juventud – (2010-14), Manuel Obregon, dazzled classical music buffs in Korea, in a rare opportunity to listen to a world-class performance by a Costa Rican pianist on Wednesday. Obregon played his compositions as well as those of Costa Rica composers, Cesar Alceo, Ulpiano Duarte, Ray Tico and Justo Santos. The performance, at a traditional Korean house in Bukchon Hanok Village in Seoul, took place with the backdrop of the sunset. The combination of a unique stage, music and wine created a multisensory experience for the audience. Obregon is known as a musician of peace and environment, and has released more than 20 albums that celebrate the relationship between music and nature as well as Central American culture. He had invited Korean artists to the country’s international cultural festivals in 2013, and has since been appointed the Cultural Goodwill Ambassador by the Korean Ministry of Foreign Affairs. Dominican Ambassador Grecia Pichardo, who participated in the event, appreciated the opportunity to listen to Costa Rican music for the first time, despite having lived in Latin America for many years. The event was organised by the Music for One Foundation and supported by Korea’s Ministry of Foreign Affairs and the Korea Foundation.